I will pass along a funny story about the book, though. 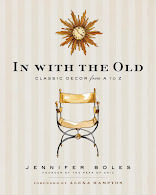 My good friend recently told me about her co-worker who bought the book for a retiring elementary school teacher because she thought it was a book about decorating! 50 Shades of Grey would be a great title for a book about color, so I don't think the co-worker was completely off her rocker! The shades of grey in this post? Now these are some that we most definitely should discuss. The home of Ramon Osuna, decorated by Antony Childs. A room by Joseph D'Urso. 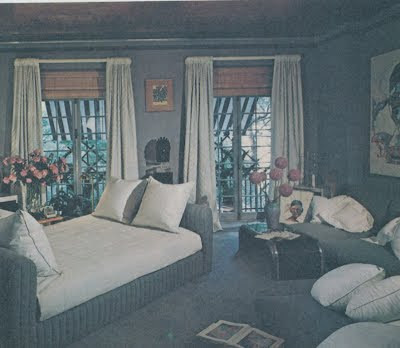 The home of Angelo Donghia. The San Francisco home of John Dickinson. 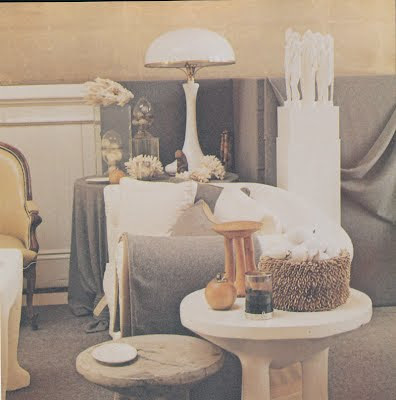 Photo #1: Les Reussites De La Decoration Francaise: 1950-1960 ; #2: House & Garden Guide to Interior Decoration ; #3: House and Garden's Best in Decoration ; #4: Tiffany Taste ; #5: Architectural Digest New York Interiors ; #6 and #7: The New York Times Book of Interior Design and Decoration . I'm sure that some of you read Tatler. If you're one of those people, I apologize in advance because this post will be a repeat to you. 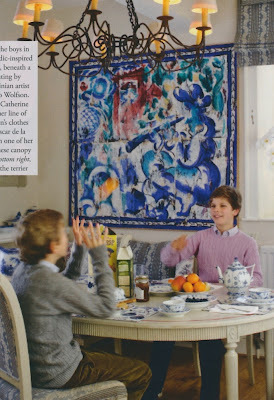 But if you haven't read the magazine's April issue yet, then I think you might enjoy seeing these photos of the Cotswolds house of designer Catherine Monteiro de Barros and family. 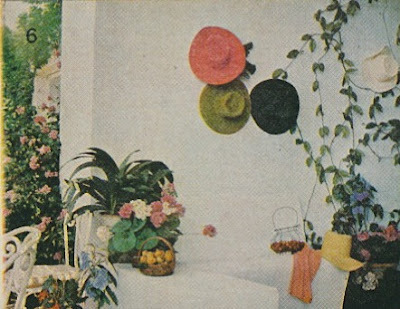 Some of you might be familiar with Monteiro de Barros; she once owned the children's clothing line Papo d'Anjo. The company shuttered operations last year, but fortunately for those of you with young children, the designer now heads up the new Oscar de la Renta children's line. 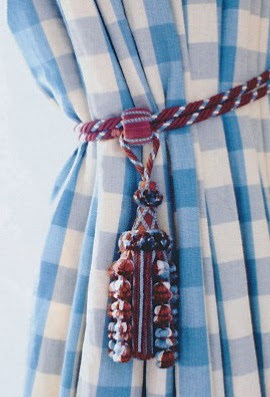 Monteiro de Barros adheres to a traditional, proper design aesthetic, something it is evident in both her childrenswear as well as in her home. Although I usually gravitate towards interiors that have a dash of modernism to them, I have to say that I find the designer's home to be absolutely charming and inviting, not to mention comfy looking too. Can you think of a better home in which to relax and spend time with one's family? 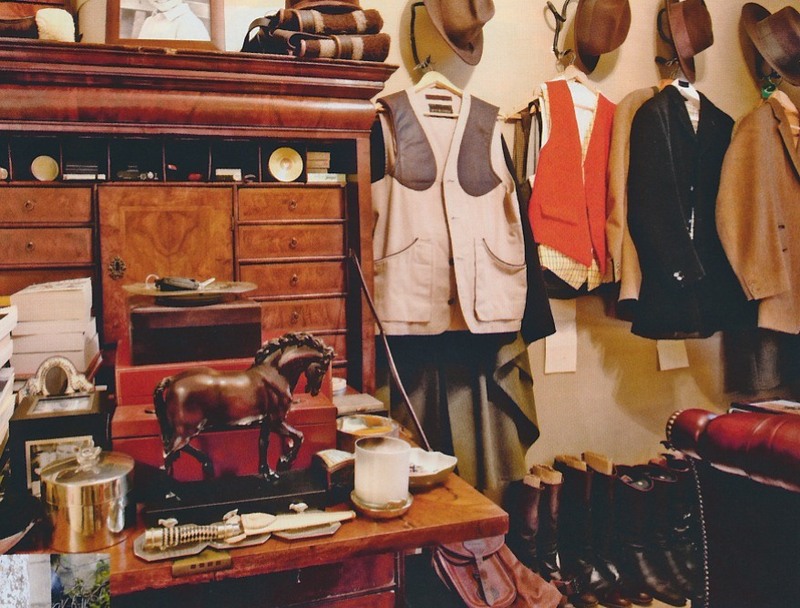 The designer's husband is obviously passionate about hunting. The Monteiro de Barros sons in the "Nordic inspired" kitchen. The painting is by Argentinian artist Ricardo Wolfson. 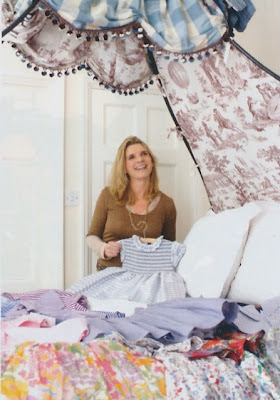 The designer with some of her childrenswear. 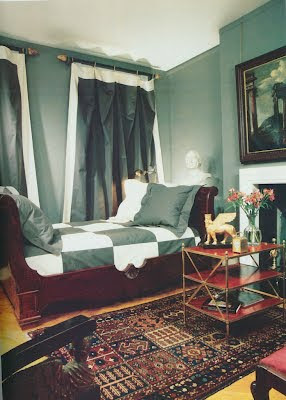 I think the canopy bed is so pretty! A guest room with Eaton check curtains. 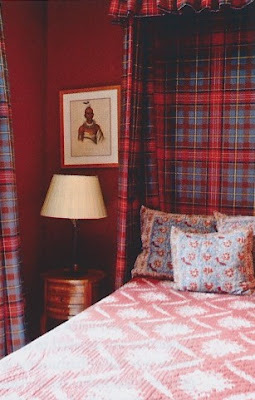 Another guest room, this one in plaid. 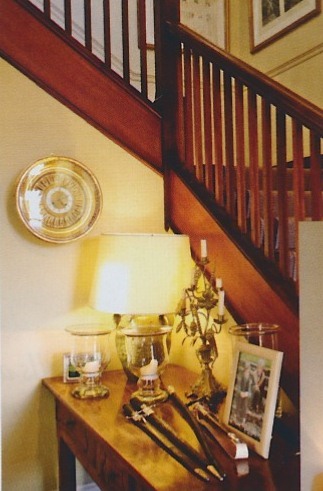 The main staircase. The clock is a Charles X sun clock. All photos from Tatler, April 2012, Tim Evan Cook photographer. 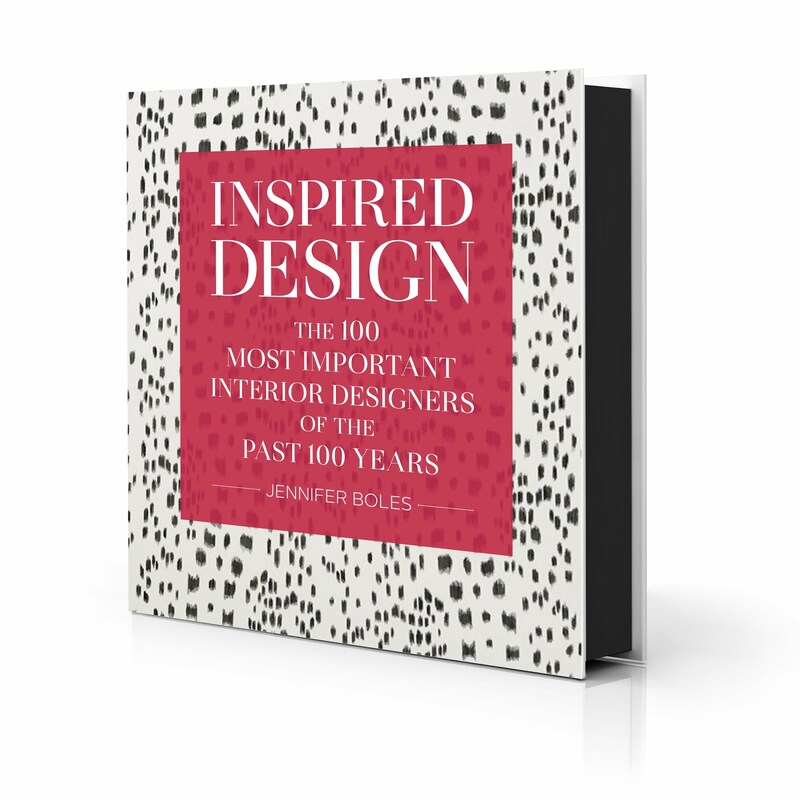 I just returned from Hickory, North Carolina where I gave a lecture on "Timeless Interiors". What a treat it was to spend time with people who are so kind, so warm, and so down to earth. It was a breath of fresh air! While I'm getting caught up on work, I want to show you a preview of a story that I co-produced for the June issue of House Beautiful. 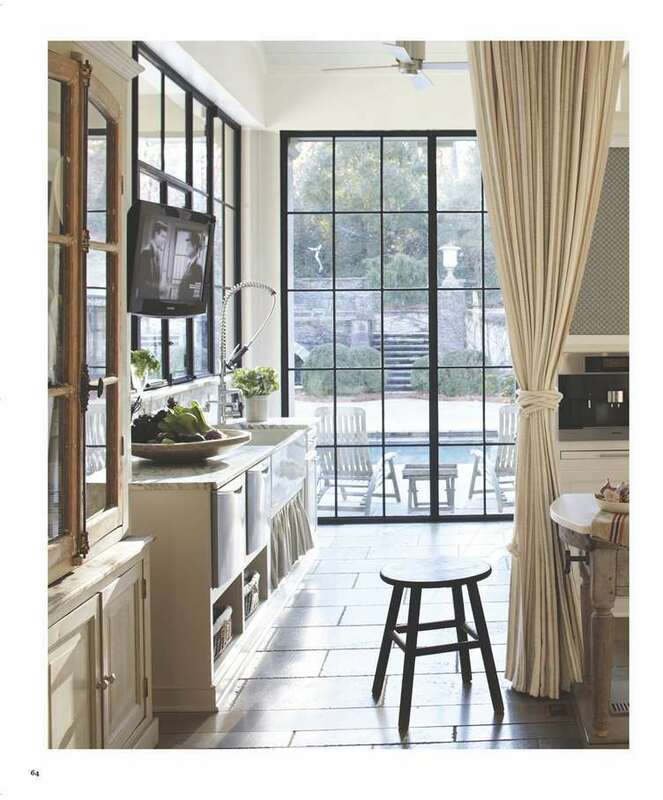 The article features an Atlanta house decorated by designer Beth Webb. 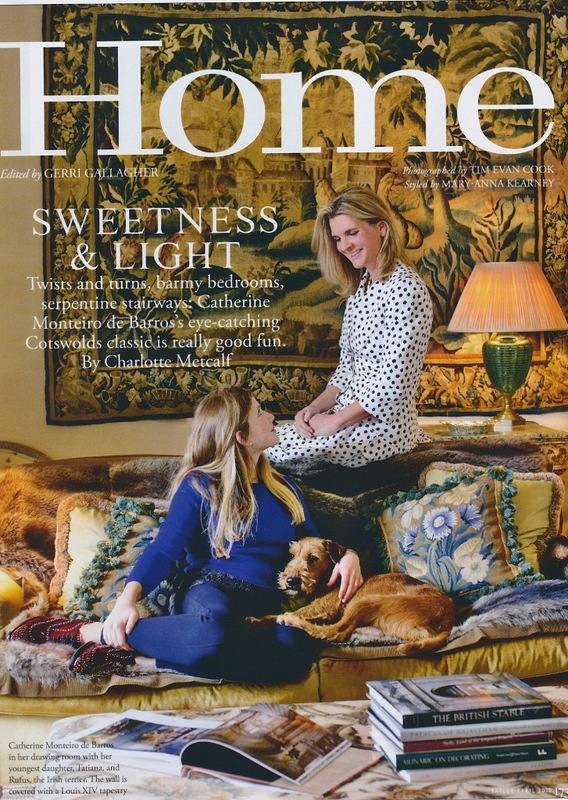 It is such a wonderful house, and the beautiful interiors made our work shooting it so easy. It was also a nice surprise to find out that the homeowner, who happens to read my blog, is passionate about design. 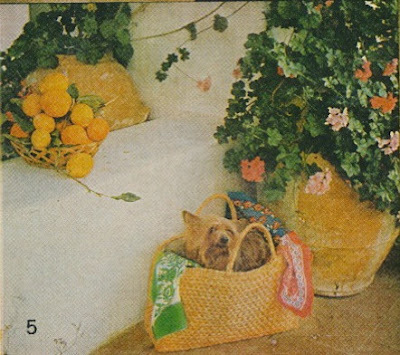 Not only does she collect vintage French design books as I do, but she also is quite accomplished at Bargello. A kindred spirit! There are many more photos in the article, so make sure to pick up a copy of the June issue when it hits newsstands this week. 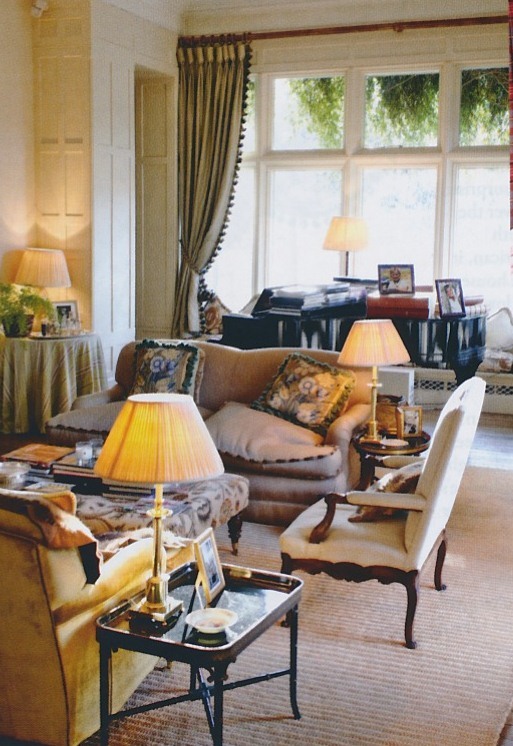 PS- The vintage pendant light in the living room, at top, is from Parc Monceau Antiques. 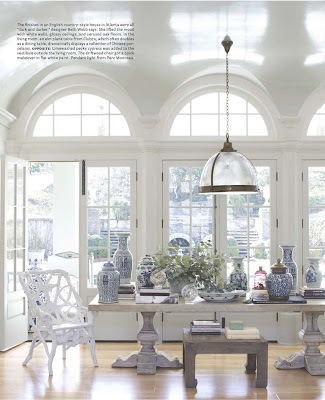 All photos from House Beautiful, June 2012, William Abranowicz photographer. trends. 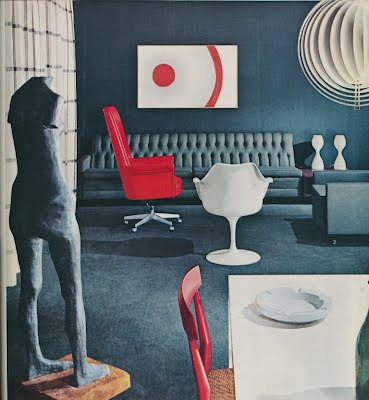 And customers often made special trips to the department stores just to see the latest model rooms. I think that the only thing comparable to this today might be the 7th Floor at Bergdorf's with its ever changing displays and vignettes. 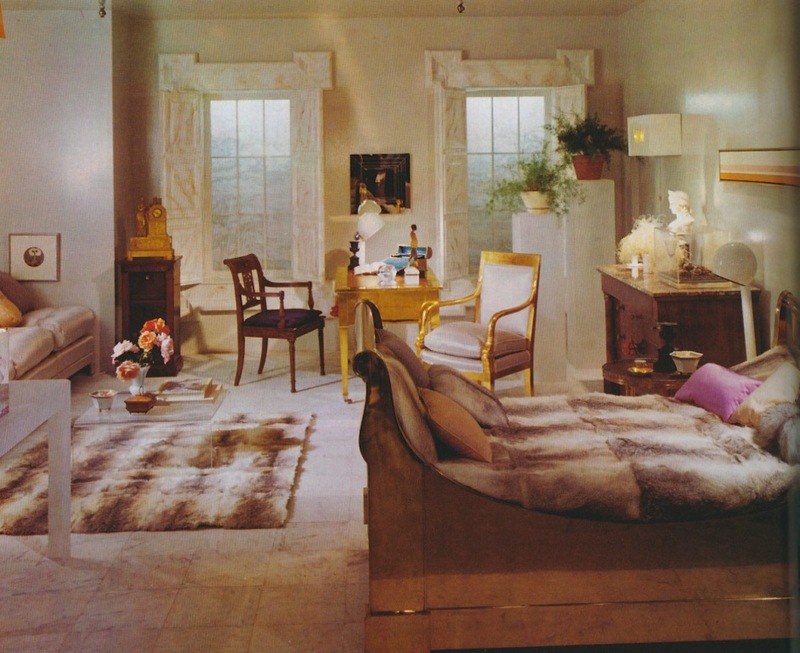 I scanned some photos from Bloomingdale's Book of Home Decorating to give you an idea of what D'Arcy's rooms looked like. 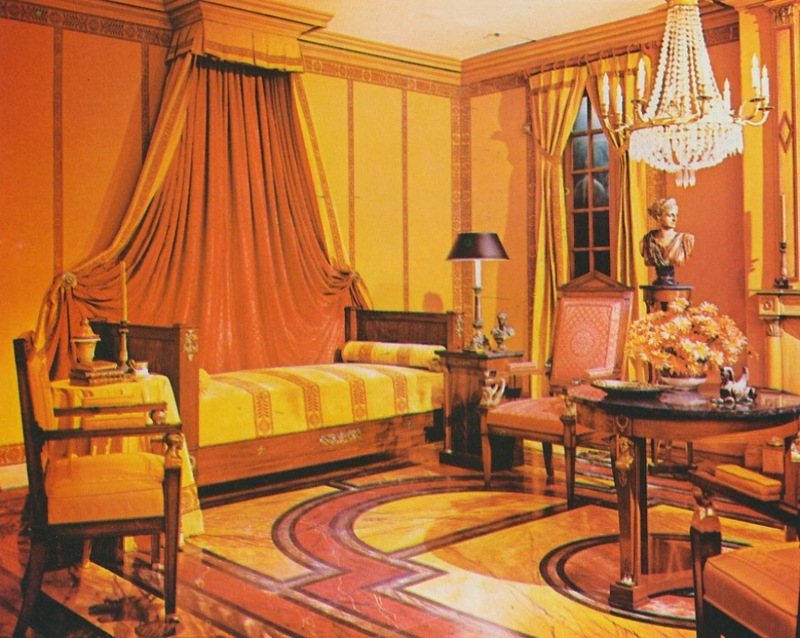 Obviously, many of the rooms reek of what was hot in the 1960s, something that makes these rooms of their time rather than timeless. But of course, that was the whole point of these model rooms; they were meant to be capsules of trends and flavors of the moment, a place in which Bloomingdale's could showcase their latest offerings. 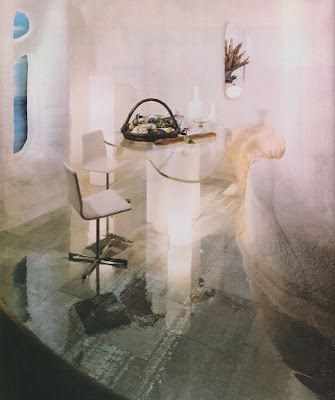 I think what is most notable about D'Arcy's rooms, though, is how accomplished she was at decorating both traditional spaces as well as groovy, futuristic looking rooms. It seems that D'Arcy's creativity was truly endless. 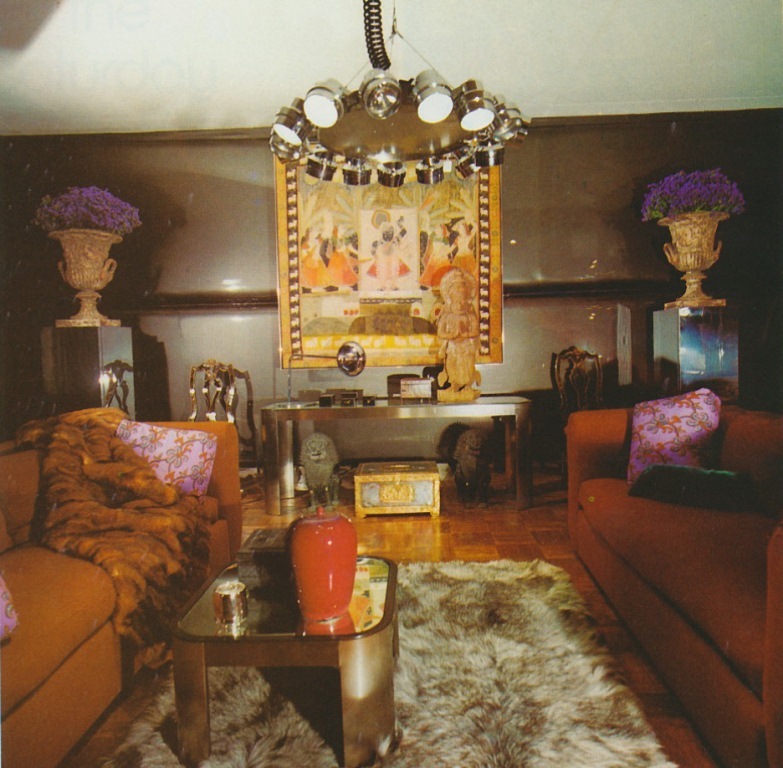 Image at top: According to her New York Times obituary, D'Arcy's Cave Room, at top, was one of her most famous rooms. 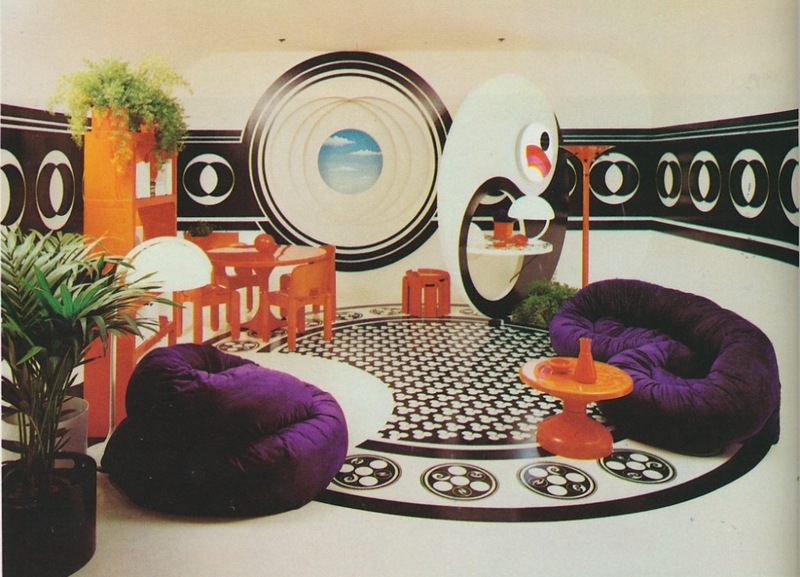 The molded walls were made of sprayed urethane foam, while the floor was covered in one-fourth-inch square mirror tiles. 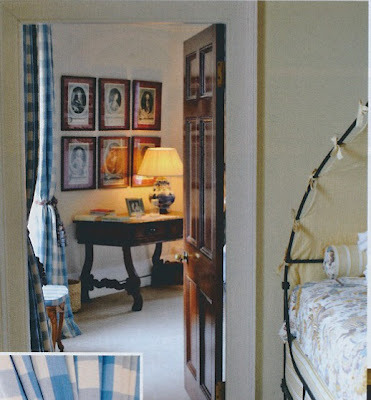 This room was inspired by D'Arcy's visit to a Japanese converted country farmhouse. The walls were covered in a plaster and straw mix, something that made the walls look "hairy", according to D'Arcy. 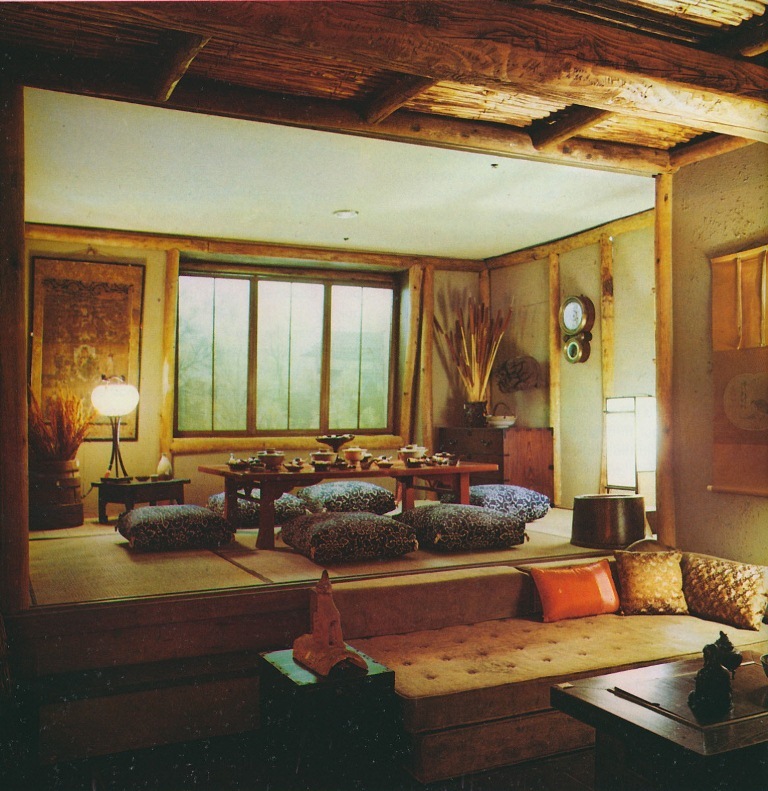 The large support beams on the ceiling were large trees, while the smaller beams were small trees and saplings. 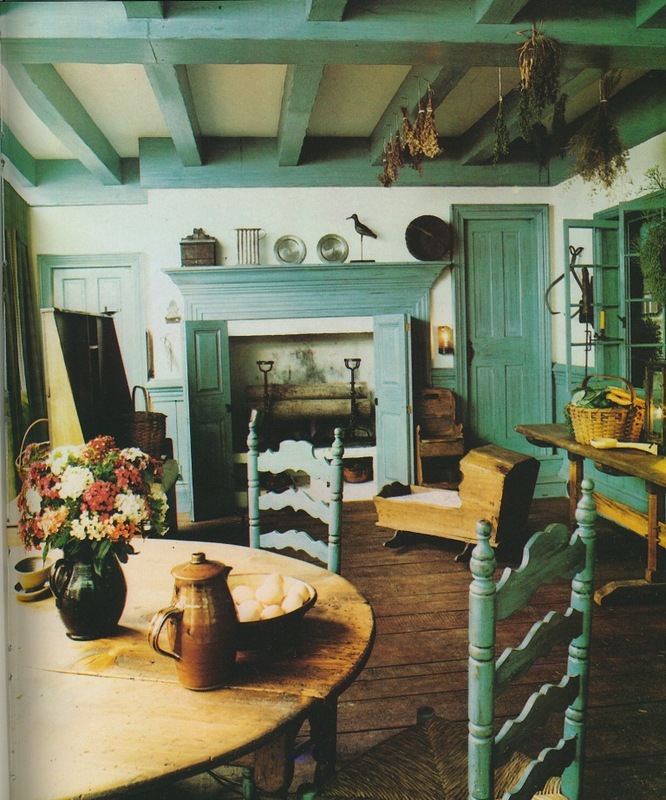 A model room made to resemble an Early American keeping room. D'Arcy wrote that this room was a recreation of one she saw in a Portuguese palace. 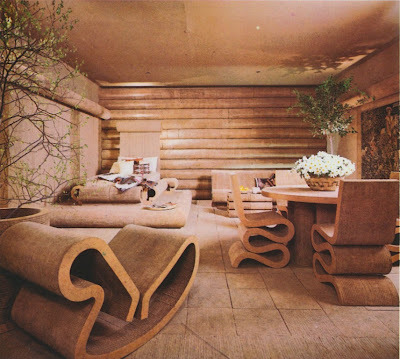 The floor was made of plywood painted to resemble marble. 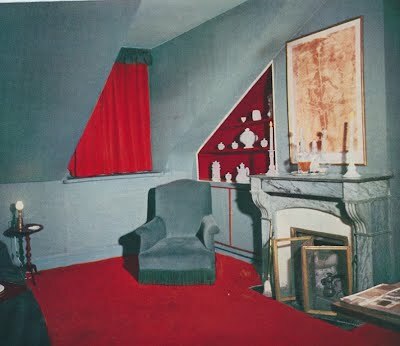 D'Arcy wrote, "This room would certainly belong to a member of the Saturday Generation." 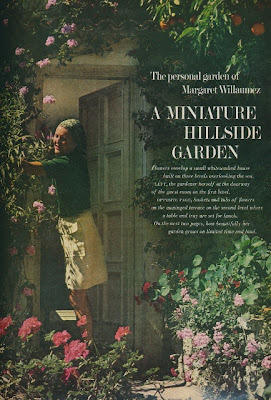 By designing hyper modern model rooms, Bloomingdale's hoped to entice young, hip customers to visit the store on weekends- hence the term, "Saturday Generation". According to D'Arcy, this room "combines everything." 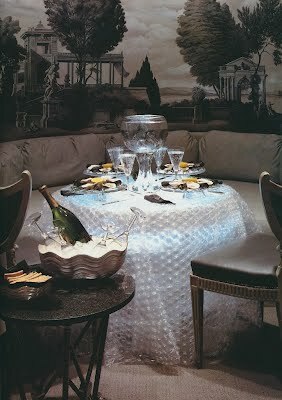 Indeed, it did, including Chinoiserie chairs, a brushed nickel and mirror cocktail table, urns holding flowers, and gunmetal patent vinyl wallcovering. Another memorable room was this room in which everything- furniture, walls, and floors- were made of cardboard. 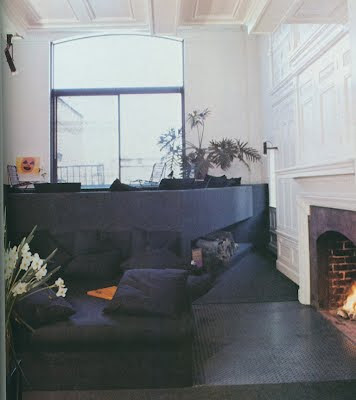 The furniture was designed in collaboration with Frank Gehry. This was the "Mary Wells Lawrence Room". The color palette was tonal, and yet D'Arcy introduced texture to give the room dimension. I suppose this is another "Saturday Generation" room. 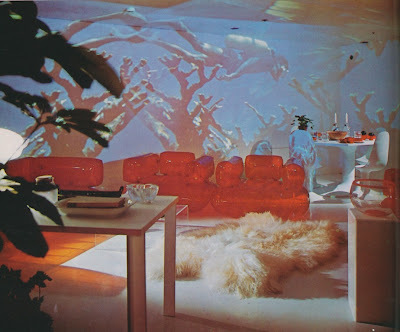 Plastic furniture and a flokati rug were placed against a backdrop of a wall upon which a projected image of a deep sea diver was shown. 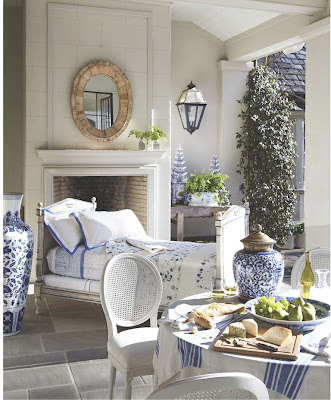 All images from Bloomingdale's Book of Home Decorating by Barbara D'Arcy. 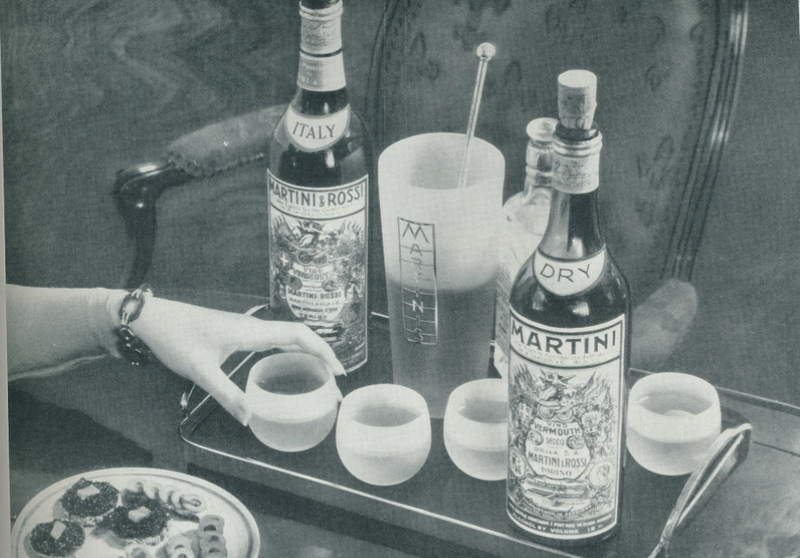 I recently found this 1934 ad, above, for Martini & Rossi Vermouth. What captured my attention was the neat little cocktail setup with those frosted cocktail glasses (which, by the way, were available at Bergdorf's). I'm not used to seeing Martinis and Manhattans served in thick, stemless glasses like those in the ad, and I have to say that they're not what I would use when serving cocktails. I can only imagine that the cocktail would become warm if the glass was held for any length of time. One nice thing about the glasses, though, was that they were the proper size for a cocktail. Back during the 1930s and 40s, cocktail glasses were small and light enough that you could hold the stem using just a few fingers. Not anymore. Cocktail and martini glasses today are enormous, as big as Alfie's head, in fact! And they require a whole hand grip, too. The problem with these large glasses is that they hold too much cocktail. The urge is to fill these big glasses with enough cocktail so as not to appear chintzy. Only problem is that by the time you finish your drink, you've had the equivalent of two cocktails- not a good thing if you're serving drinks before dinner. 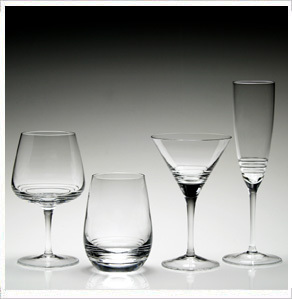 Ideally, a cocktail glass should hold between 4.5 and 5 ounces of liquid. 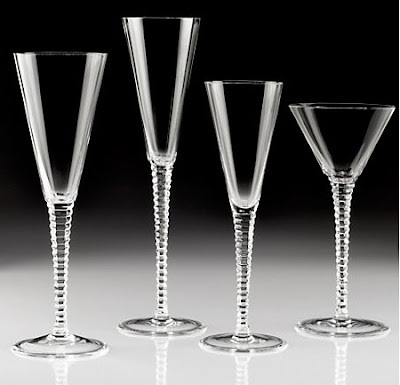 While it's worth seeking out vintage cocktail glasses for both their jazzy designs and their economical sizes, there are, fortunately, some new collections that include correctly sized glasses too. William Yeoward's glassware is never super-sized, but that might be because he's British. 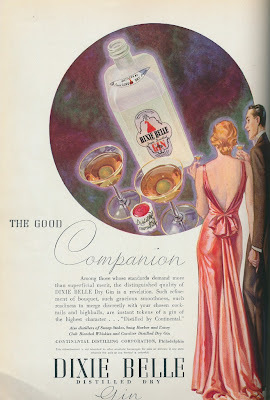 His new American Bar collection is quite handsome and affordable too. But if you insist on drinking from those monster 12 oz. glasses, fine. Just don't blame me in the morning. William Yeoward's Greta glassware includes a 5 oz. 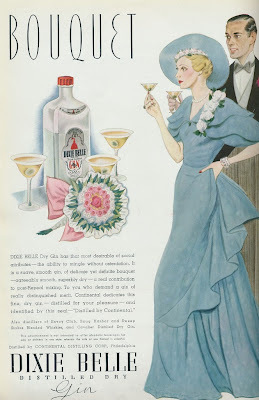 martini glass. 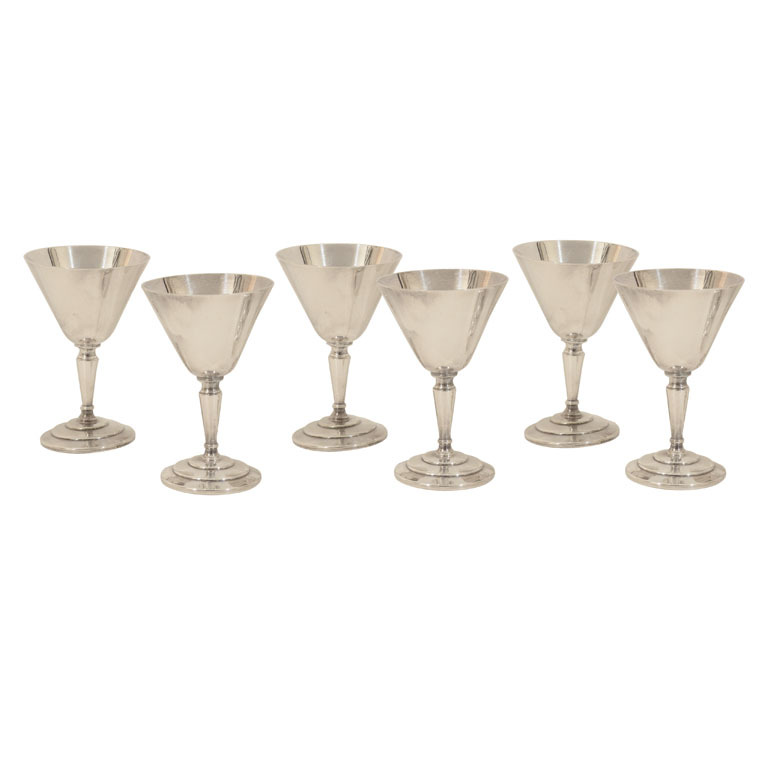 C. 1930 Mappin & Webb set of cocktail glasses, available through Foundwell. While I'm partial to red blooming geraniums, pink, coral, and white are fine by me too. And did I mention how easy they are to care for? They only require some sun, a good watering, and the occasional deadheading. But I'm certainly not the only one who is a fan of the geranium. 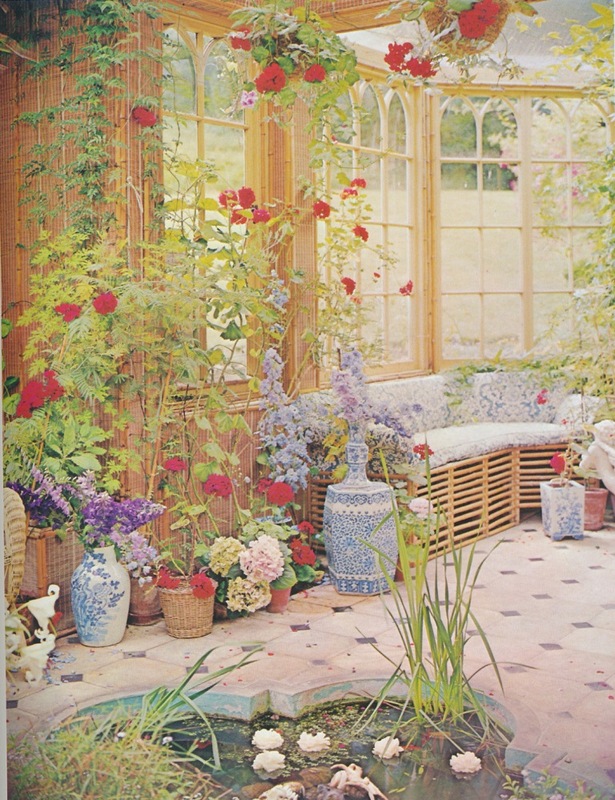 Take a look at some of the others who admire this most genteel of plants. 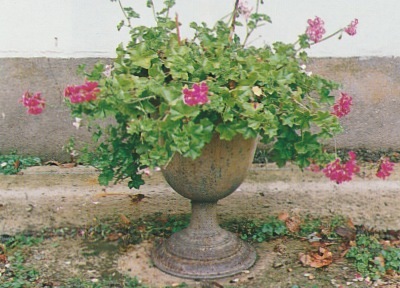 Image above: Lady Diana Mosley (née Mitford), had pots of geraniums including this one scattered around her garden at her Paris home, The Temple of Glory at Orsay. During the annual Festival of the Patios in Cordoba, Spain, townspeople decorate their patios, terraces, and balconies with geraniums and other plants. 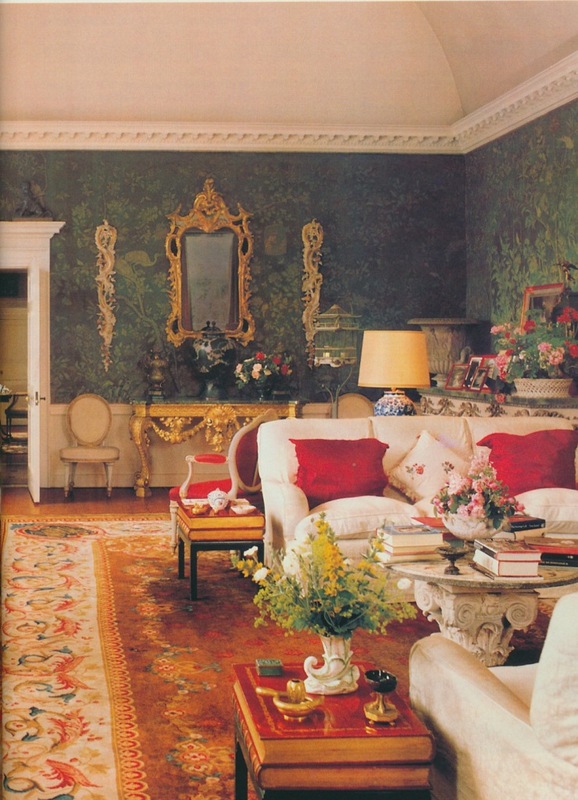 Cecil Beaton grew scarlet colored geraniums- and lots of them- at Reddish House. The very elegant drawing room at Bentley in Sussex, owned by Mary Askew. Note how the red of the geraniums, pillows, and book end tables punctuate the room. Countess Margaret Willaumez and her dog Moppet enjoyed the geraniums at their home in Capri, Casa Lontana. 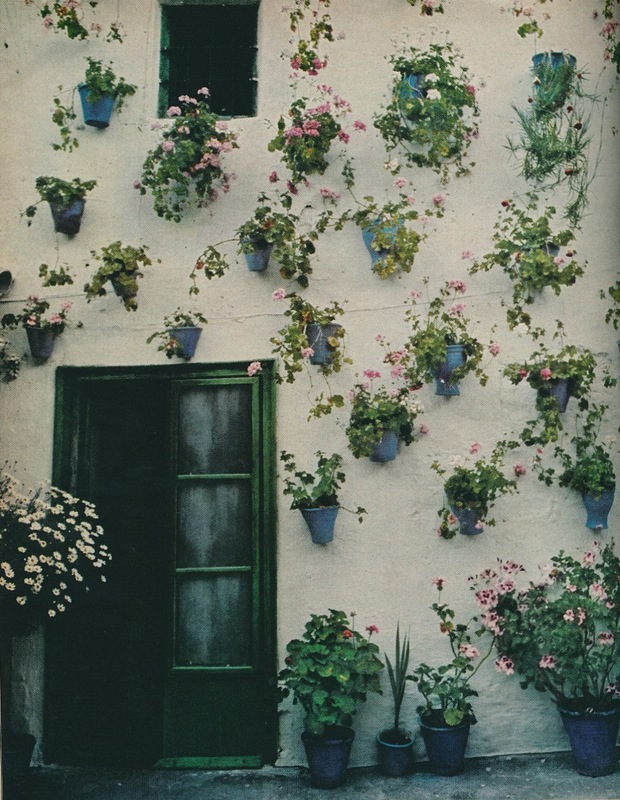 Image at top from The Finest Houses Of Paris ; Cordoba, Spain photo from House & Garden, November 1971; Beaton photo from Celebrity Homes: Architectural Digest Presents the Private Worlds of Thirty International Personalities ; Bentley photo from Country homes (The Worlds of Architectural digest) ; Willaumez photo from House & Garden, January 1970.